Waste Management Phoenix Open betting tips & predictions – dubbed “The Greatest Show on Grass”, the Waste Management Phoenix Open at TPC Scottsdale has no problem living up to its name. In addition to playing host to the biggest names in the game, the tournament is the PGA Tour’s best-attended event – drawing nearly 500,000 enthusiastic spectators each year. 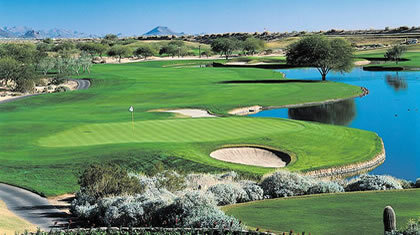 Formerly known as The Phoenix Open and The FBR Open, the event has been hosted by the TPC Scottsdale Stadium Course since 1987. Unlike other tournaments, spectators become central to the Waste Management Phoenix Open, helping to transform the famous 16th hole into “The Coliseum” – the loudest hole in golf. In 1997 a 21 year old Tiger Woods aced the 16th in what is one of the most famous holes-in-one of all time. In 2014 the City of Scottsdale carried out an extensive renovation of TPC Scottsdale under the supervision of architect Tom Weiskopf. The project included the relocation of four greens, resurfacing of all greens, reshaping and re-grassing all tee complexes, relocation and reshaping of all bunker complexes and re-landscaping of desert areas. The result was a more aesthetically pleasing resort for guests and strategically more challenging to PGA Tour players. Course knowledge around TPC Scottsdale is a plus and those with solid Event Form should be given due consideration. It is a ball strikers course and all aspects of a player’s game needs to be in tune. The big hitters will have a slight advantage on the gettable Par-5 15th and the driveable Par-4 17th. However, water is in play on both these holes so errant tee shots will be punished. Hitting plenty Greens in Regulation is key for success. Last year, Gary Woodland birdied three of the last four holes to finish the week -18 (266) and earn a playoff with fellow Kansas native Chez Reavie. A par on the first hole of a sudden death playoff was enough to get the job done and earn his third PGA Tour victory. In 2017, Hideki Matsuyama prevailed winning his second PGA Tour title of the season and fourth overall. He is the sixth player to successfully defend the title having won the year previous. He won on the fourth hole of a playoff outlasting Webb Simpson with a birdie putt on the short Par-4 17th. Matsuyama finished the week T6 in Driving Accuracy, T19 for Driving Distance, T2 in GIR and a mediocre 47th in Strokes Gained Putting. In 2016, Rickie Fowler let a two shot lead slip away on the Par 4 17th hole when he hit a driver through the green and into the water. This opened the door for Hideki Matsuyama who went on to capture the title in a dramatic four hole playoff. Matsuyama finished the week 35th in Driving Distance, T44 for Driving Accuracy, 1st for GIR and 16th for Scrambling. His ball-striking delivered the lions shared of his strokes gained on the field average finishing 10th in Strokes Gained Driving and 5th in Strokes Gained Approach. The 2015 winner, Brooks Koepka, beat Hideki Matsuyama, Bubba Watson and Ryan Palmer by one stroke finishing on a score of -15(269). He finished the week inside the Top 10 for Driving Distance, GIR and Scrambling. He was T18 in Strokes Gained Putting racking up an Eagle and 18 Birdies. He squared only 4 Bogeys for the tournament. Hideki Matsuyama 12/1 (E/W) – his TPC Scottsdale pedigree is impressive to say the least with back-to-back victories here in 2016 & 2017. Event Form aside, its his form in last week’s Farmers Insurance Open that puts him firmly on this week’s radar. On his way to a T3 finish he was 3rd in Strokes Gained Tee-To-Green (South Course), racking up 20 x birdies & an eagle for the week. When Hideki gets into this kind of groove it is wise to take notice. Webb Simpson 22/1 (E/W) – has good form around TPC Scottsdale with his stand out result a playoff loss to Matsuyama in 2017. Started this season impressively with 3 x Top 15 finishes in as many starts including a T8 in his last outing in the Sentry TOC. A back-to-his-best game puts him 2nd in this week’s Stats Analysis table. He is also currently 8th on Tour for Driving Accuracy, 18th for GIR and 7th for Scoring Average. Remains as consistently strong as anyone. Event Form check, Current Form check, Stats Analysis check – hard to ignore. Harbour Town Golf Links – 7,100 yard+ Par 71, designed in 1969 by Pete Dye in consultation with Jack Nicklaus. The course has water in play on half the holes and greens are very small. Accurate iron-play to find the small greens is vital around Harbour Town Golf Links. Even the most precise players will miss the odd green so getting up-and-down successfully is important. Past champions tend to play well here and multiple winners are not uncommon. Harbour Town Golf Links is the only host course the event has known so course form is key. This week is all about precision over power. Kodaira finished the week T4 for Driving Accuracy, 65th for Driving Distance, T7 for GIR and 16th for Strokes Gained Putting.